Moving to a cloud-based emailing system is an intelligent decision. While using a cloud-based email application, users can access their mailboxes online from anywhere using any device. That is why most of the organizations are moving to Microsoft Office 365. Organizations using Novell GroupWise are also not an exception. 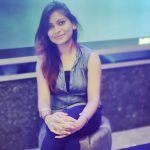 Novell GroupWise is a messaging platform that supports email, calendaring, personal information management, instant messaging, and document management. It supports Linux, Windows, and Macintosh platforms. Microsoft Office 365 is a subscription-based online service which includes MS Office applications, Exchange Online, SharePoint, Lync, and Microsoft Web Apps. It has many advantages over on-premises installations like Novell GroupWise. Universal Accessibility – It gives access to emails, documents, contacts, and calendars from anywhere on any device like desktop, laptop or mobile. Users can access their mailboxes anytime too. Zero Initial Investments – With Office 365, there is no need for an on-premises server. It eliminates the costs involved in the management and maintenance of physical servers. Easy to Learn and Use – It is easy to use. Users can learn everything as they use it. Security and Reliability – Office 365 has a lot of inbuilt security features to keep the data safe. Microsoft data centers are vigilant about safeguarding your data. Thus, Office 365 is quite reliable. Kernel Office 365 migrator for GroupWise is a smartly designed tool to migrate mailboxes from Novell GroupWise to Office 365. Its outstanding features like Batch Migration, Intelligent Filters, Archive Migration, and Advanced Migration Settings makes it a highly professional tool for GroupWise to Office 365 migrations. This tool can migrate one or more GroupWise mailboxes to Office 365 as per the user requirement. How to migrate a single mailbox from GroupWise to Office 365? 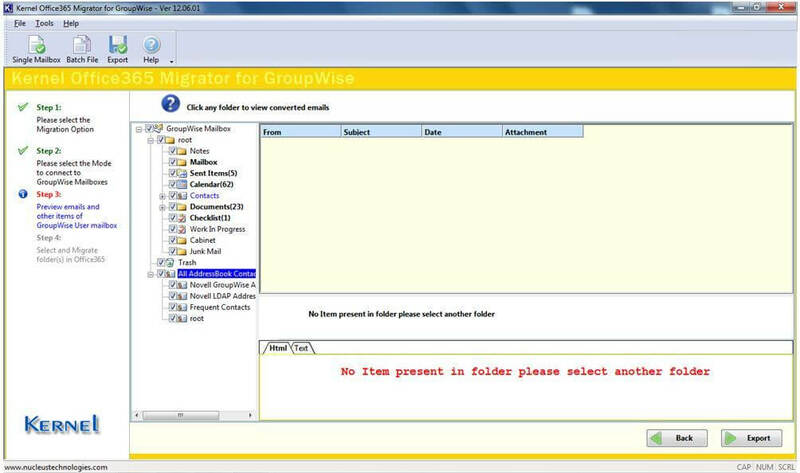 Launch Kernel Office 365 Migrator for GroupWise and click Select this option to migrate single GroupWise mailbox. Click Next. To connect to GroupWise mailbox in default mode, select the Use Default option (it is selected by default in the software). Click Next. Note: To migrate archive files, check the Show Archive checkbox (you can specify the archive path or use the default path). Now, all the GroupWise mailbox folders will be displayed in a tree-like structure. Select a folder in the left pane to view its items. You can see a full preview of the selected item in the bottom of the right pane. (the selected item can be viewed in HTML or Text format). Select the required folders and click Export. To filter the mailbox data, select the item type and specify a date range. 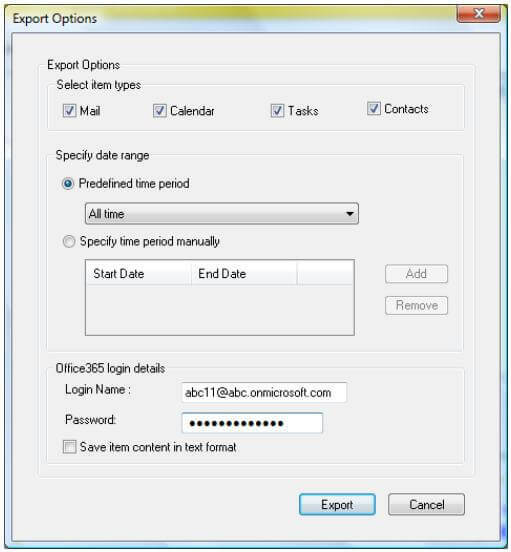 Provide Office 365 login details. Click Export. Note: By default, the item content will get saved in HTML format. To save in Text format, select the Save item content in text format checkbox. The software displays the progress of the export process. At the end of the migration, a link to the saving path will be displayed on the screen. How to migrate multiple GroupWise mailboxes to Office 365? 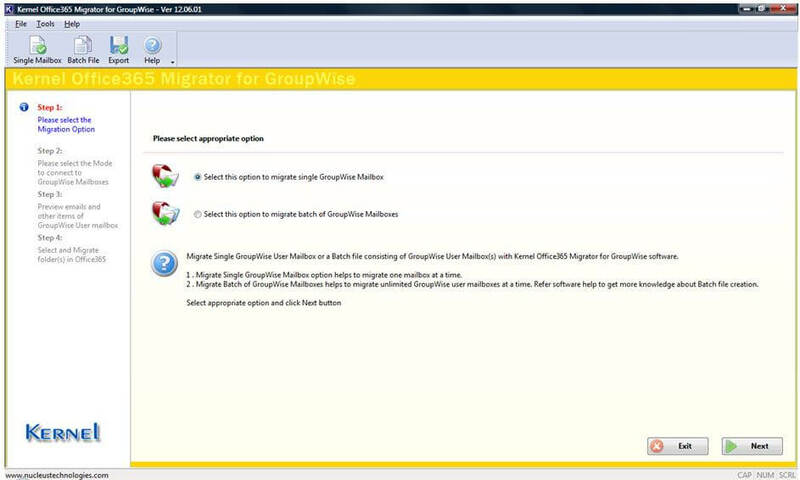 Kernel Office 365 migrator for GroupWise supports batch migration (multiple mailboxes migration at a time). For Batch migration, you have to create a batch file first. 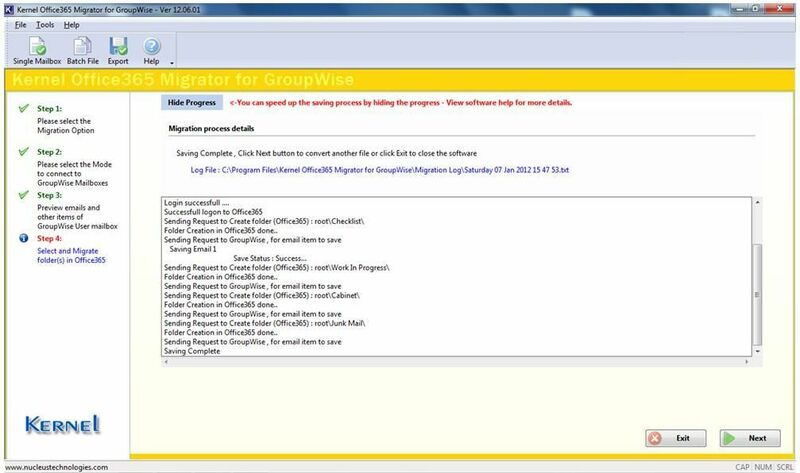 To start the migration, click Select this option for batch migration of GroupWise mailbox button in the tool and proceed. You can export multiple mailboxes to Office 365 after selecting the batch file. All the mailboxes will get exported to Office 365 quickly without much manual intervention. 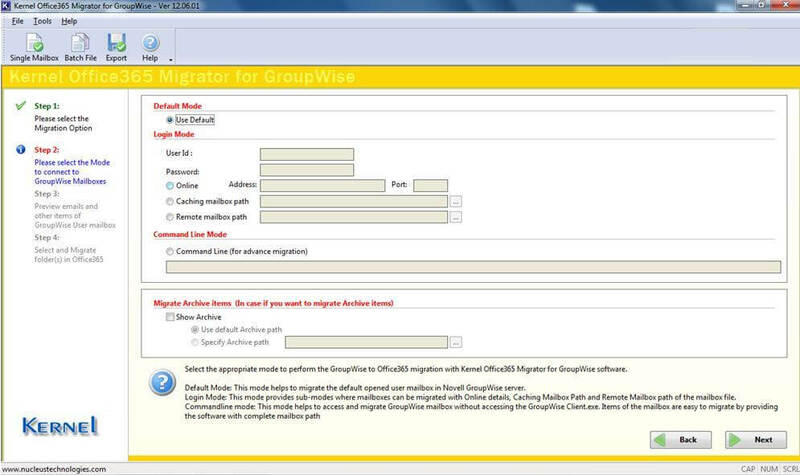 Kernel Office 365 migrator for GroupWise tool helps in the quick migration of Novell GroupWise mailboxes to Office 365. You can migrate one or more mailboxes at a time based on your requirement.